Working with or without a native speaker, a storyteller can touch the minds and hearts of all listeners-even those with little or no English language skills. 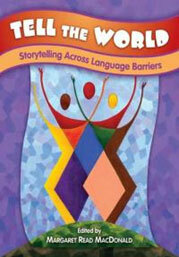 Here a group of expert storytellers share a variety of tips and techniques that help bridge the language gap; along with sample stories that librarians, teachers, and professional storytellers can easily incorporate into their repertoires. Four basic techniques for bilingual telling are explored: summarizing, line-by-line translation, tandem telling, and inserted phrases. In addition, contributors discuss such topics as the translator's role, using story in language instruction, presenting tellers of other languages, traveling and giving workshops abroad, and more. On the storytellers podcast "The Art of Storytelling with Children" I spoke with host Eric Wolf about "Telling Across Language Barriers"